Welcome back readers. I greatly appreciate you guys sticking with me considering how idle the blog has been the past few months. Look for this to change very soon. I have some very interesting things in the works that I will be rolling out in the coming months. During the month of March, the portfolio was still working on auto pilot. So there isn’t a lot to report. I received and reinvested the dividends. That’s it. The update is over…..
Just joking. Let’s look at just how well my portfolio runs on autopilot. No new additions during March. It wasn’t a record month but I am still very happy with the performance for the month. 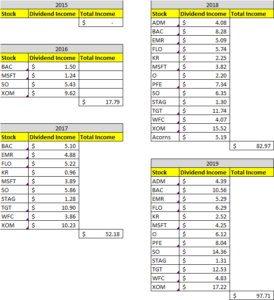 March was the last month of Q1 and accounted for $97.71 of my 2019 Dividend Income. 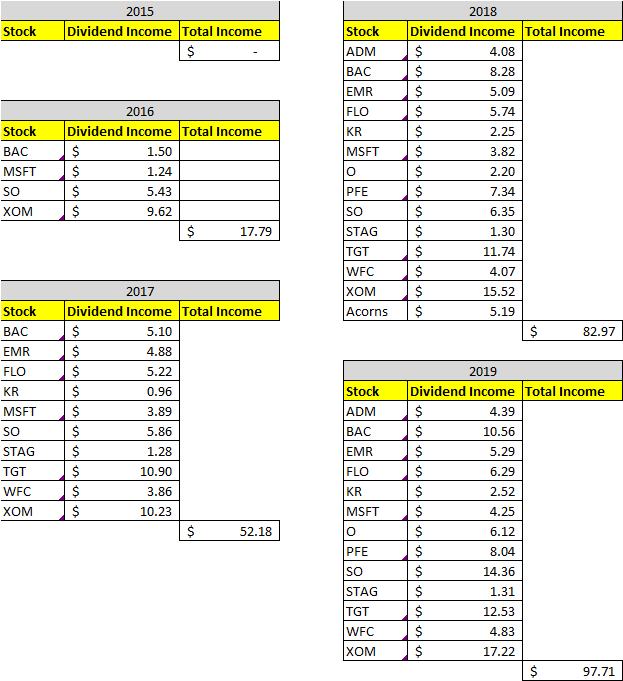 In total during 2019, I earned $209.02 in dividend income! 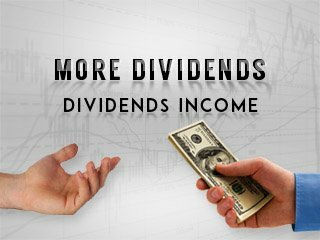 Year over year, I saw an 18% increase in dividends earned during the month of March. Let’s take a look at the year over year comparison. Small changes in allocation because of the market but none significant enough to be concerned about at this point. Reinvested dividends and the market have driven the changes in my portfolio. I am very excited with how it is doing right now. Let’s take a look. 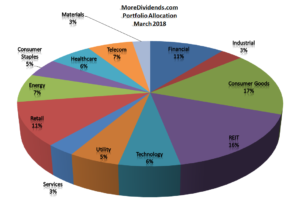 Here are the articles that I posted on MoreDividends.com during March from oldest to newest. March will be the end of the autopilot. I will be more active moving forward. The reinvested dividends are very nice but I will be infusing more capital into the portfolio. I have been very please how well the portfolio has done while on autopilot. The past few months has really shown me that I am working a good strategy because the portfolio continued to compound even when I was off doing other things in life. If you would like to receive an email whenever a new article is published on More Dividends just enter in your information below! Congrats. Your report shows the beauty of passive income from dividend investing. It is inspiring. Congrats on a great month! 18% YOY growth is awesome! Keep it up!